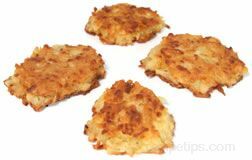 A potato pancake, common in German homes, that is very similar to the American version of hash brown potatoes. A latke is made from small pieces of grated potatoes that have had flour or corn meal, an egg, onions, and seasonings added. After the grated potatoes have had the other ingredients added they are formed into a flat pancake-like shape. The cake is then fried on each side in vegetable oil and served with a topping of applesauce or sour cream. This potato cake is a traditional Jewish food most often served during Chanukah, representing the desire to consume food cooked in oil as a means to honor the meaning and ritual of the Chanukah oil.